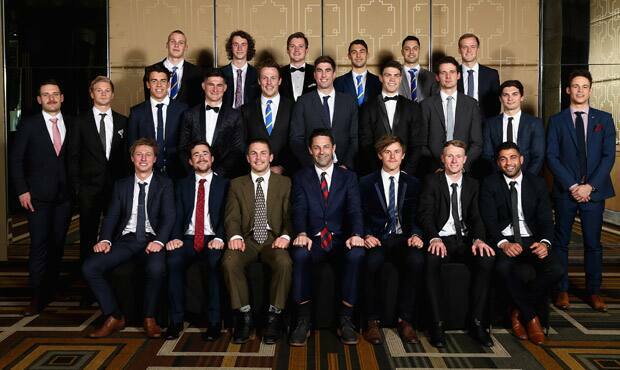 Aaron Heppell, Nick Hind and Danny Younan (bottom right) were named in the VFL Team of the Year on Monday. Essendon has featured prominently in the VFL Team of the Year with a trio of Bombers earning the nods at the JJ Liston/Lambert Pearce Medal after outstanding home and away seasons. Vice-captain Aaron Heppell (half back flank) and leadership group members Nick Hind (wing) and Danny Younan (forward pocket) were all part of the honorary team of 24 recognised for their outstanding performances at Crown Palladium on Monday night. The selections were the first for Hind and Younan, with Heppell adding a second Team of the Year guernsey after earning his maiden nod back in 2016. Hind’s ability to win the ball at contests and use his speed and agility to devastating offensive effect was a hallmark of Essendon’s season. Heppell’s relentless competitiveness and commitment to the team made him one of the most valuable and consistent Bombers, while Younan not only topped Essendon’s goal-scoring with 34 majors but made madcap forward pressure and ground-level hustle his base. Early in the count, it looked as though AFL Bomber Aaron Francis would be leading the charge for Essendon. The defender was amongst the early leaders, polling eight votes by round 10. Hind’s form saw him nominated for the Fothergill-Round-Mitchell Medal for the VFL’s best player under 24 and carried into a commendable tally in the JJ Liston Medal count. The speedster came tearing home in the count, finishing with a team-high 13 votes for the season to finish equal fourth in the overall poll.